Maybe it’s because we’re into a new year and everyone is talking about exercise and eating right… Sometimes, when the cocktail hour rolls around I crave something less than booze but more than soda or juice–an adult drink. A while back I took my niece to Foreign Cinema–one of my favorite haunts–and I was impressed by the list of virgin cocktails. Well-thought-out elixirs to give kids and teetotalers alike a fair shake at a sophisticated dinner table. So then what? 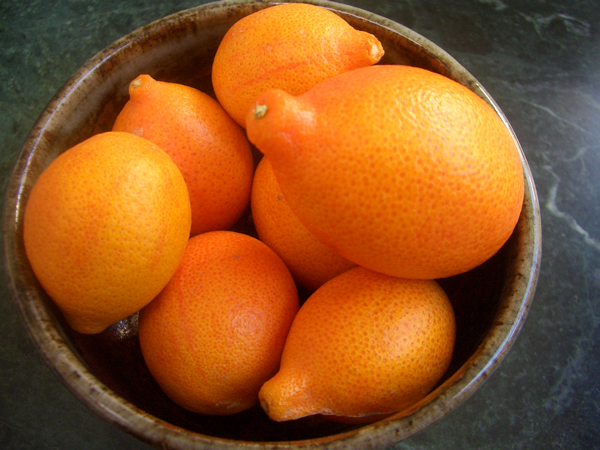 … I was in the new BiRite Grocery perusing the lovely fruit and veg and they had a bushel of Nagami kumquats, the slightly larger variety of the fruit. I don’t use kumquats very often. We had a tree outside our house when I was growing up and we basically let them rot on the ground. Wasteful..Shame on us. But I was choosing to bring these lovely little fruits into my home and committing to doing something cool with them. I hope I pulled it off. 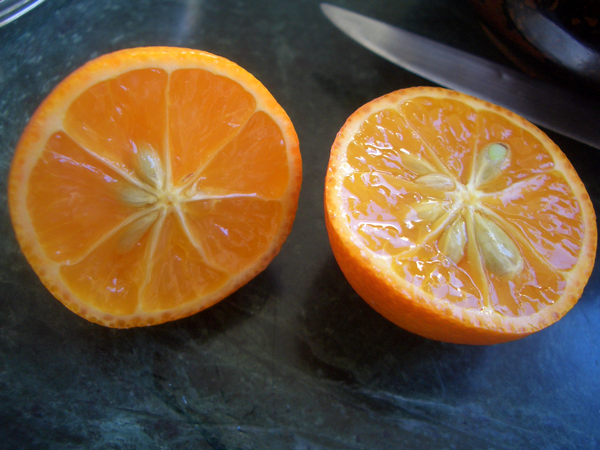 Kumquats, when eaten raw, are usually eaten whole, skin and all. The skin can be the sweetest part. The juice tastes like a mixture of tangerine and lemon. It’s very tart but just sweet enough to stay this side of yikes. The flavor slows you down in a good way, and encourages you to sip instead of gulp. We are having a bit of summer and a whole lot of drought in the middle of winter… This would be great drink when the real heat hits, served in tall glasses with lots of ice. 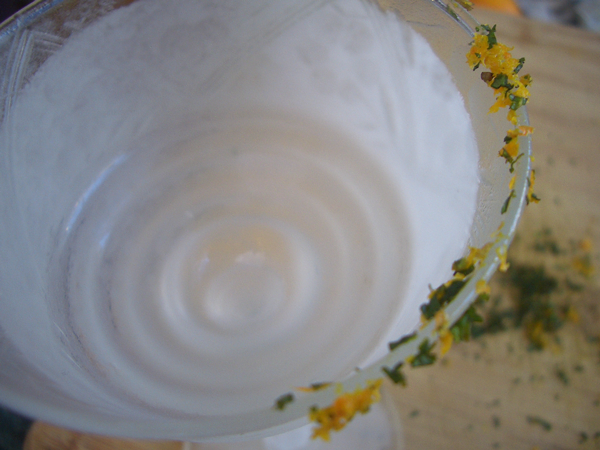 But for now, in the dark weird heat of winter, alongside pre-dinner nibbles, a frosted martini glass would be lovely. 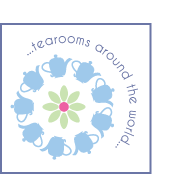 To make the tea I used 1 tablespoon/15ml white tea per 2 cups of water, put it in a jar in the refrigerator and left it to steep overnight. Put the glasses in the freezer to chill. Zest the kumquats before you squeeze them. Mince a few leaves of mint and toss with the zest. Set aside. Juice the kumquats. You can use a reamer/juicer, or just squeeze them with your hand. They’re a little small and awkward for a juicer, but it can be done. If you juice the whole fruit be sure to remove the seeds first. 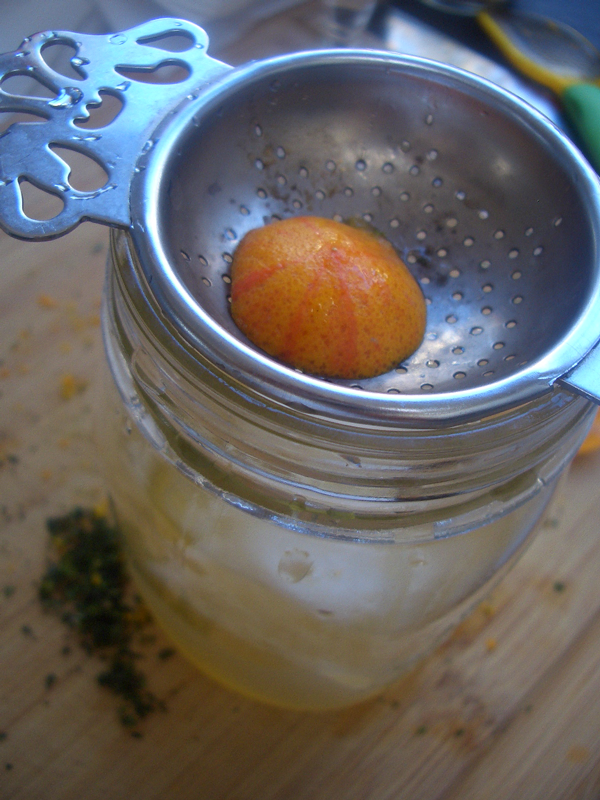 Add some ice to a Mason jar/pitcher/measuring cup, and add the juice, tea and tonic. Stir to combine–don’t shake. Remove the glasses from the freezer. 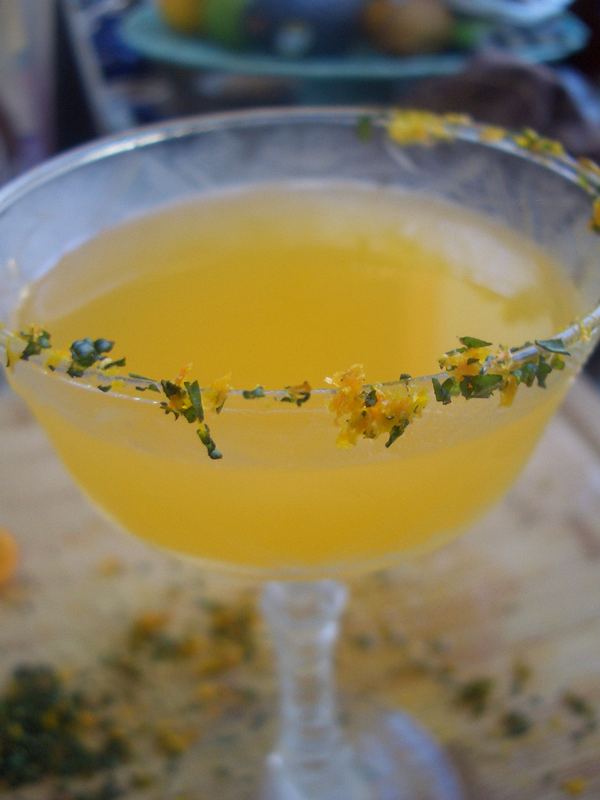 Dust a cutting board or plate with the mint/zest mixture and tap the rim of the glass in the mint/zest until you have a nice sprinkling around the edge. 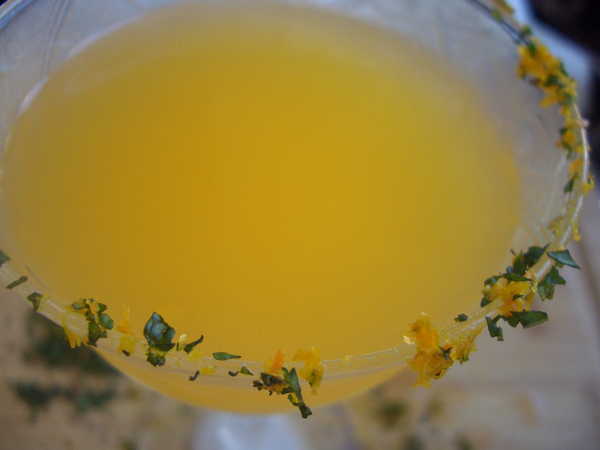 Strain the juice/tea/tonic into the glasses and serve immediately.